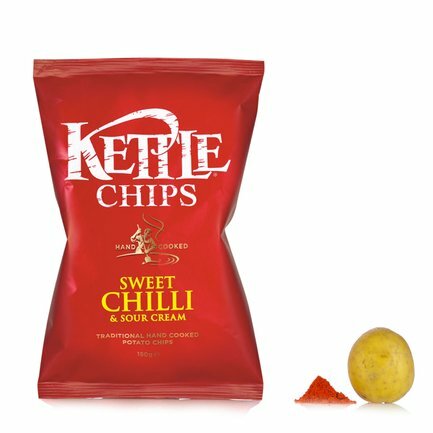 Kettle is the queen of bagged crisps thanks to their selection of natural ingredients and the use of high quality oil for frying. The 'Sweet chili & sour cream' flavour combines two complementary flavours into a unique and delicious experience, inspired by the balance of the Thai cuisine: the intense sweet pepper combines perfectly with the freshness of sour cream. Ingredients Selected potatoes, sunflower oil, sweet chilli pepper and sour cream sauce (sugar, powdered sour cream, skimmed milk powder, fermented milk powder, sea salt, powdered onion, yeast extract, powdered chilli pepper, powdered peppers, dried red pepper, powder For more information on product labels, please contact our Customer Service department. The information on the labels of the products may vary for reasons beyond our control, therefore, there may be discrepancies between the information on the site and that on the products delivered. Please always check the information on the product before consumption or use.